Bolt Pattern is 6 inch on 6 inch, meaning from center of stud at the 12 O'clock Position to the 6 O'clock position is 6 inches. Offset is +1.125, what does that mean to you? Let use help you get a better idea of what that means to you and why this is important so you have no fitment issues. This wheel is 8 inches wide, if you measure 4 inches in from the front side of the wheel that would be Zero offset, this wheel would be +1.125 towards the front of the wheel at you look at it, or the front center disc would sit 3.88" from the front face of the wheel excluding about a 1/4to1/2" of rim flange. Not sure if this will work for you? No Worries, Call us, we can help you. 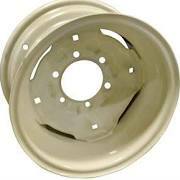 This wheel is reversible center disc. That means you can flip the wheel around to fit a more negative offset. What does that mean? If you flip the wheel around that would push the wheel inner edge further away from the hub for greater clearance. Our Implement replacement Wheels offer you all you need to get rolling again. 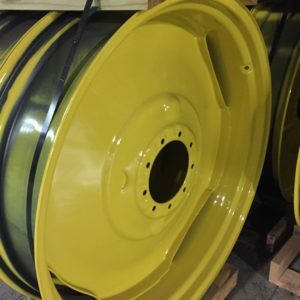 Minimize expensive downtime caused by a damaged wheel by having a spare wheel on hand and ready to go so your equipment—and business—stay running smoothly. Need tires for your implement wheels? No Worries, we can custom make you any tire and wheel combination you need to fit your exact needs. Simply contact us! Yes it is that easy. Many others on the internet are just selling you part numbers, we provide you Agriculture Solutions! If you are a OEM Manufacturer in need of cost savings, simply contact us for operation cost savings Just In Time Inventory Management Solutions Program. Large or small request are welcomed!